Our mission is to make learning to read fun and engaging. Our online Story Twiggles member site offers a library of engaging, leveled, interactive digital books for emergent readers. 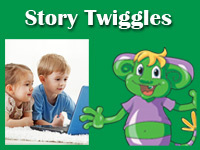 Our digital online Twiggle Books contain beautiful illustrations coupled with fun animations, music, and sounds. Each word/sentence can be clicked and listend to. Twiggle Books are fun and engaging stories to read aloud to your children, to be listened to, or to be read by emergent readers who are just starting to read on their own. Twiggles Books are for children ages 2-7 years old. Click here to view free sample stories. 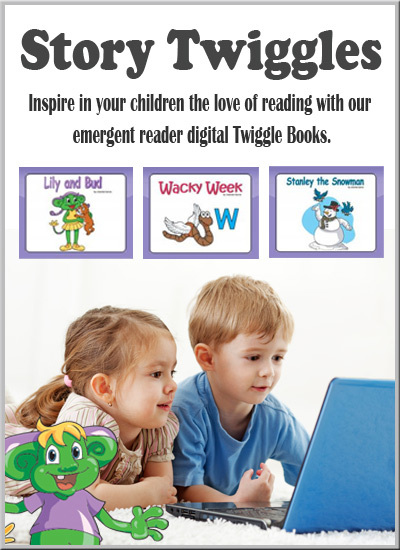 Our interactive online Twiggle Books are designed to be fun, engaging, and to instill confidence and the love of reading in young children. As a member of Story Twiggles, you will have access to our Story Twiggles library. You will be able to listen to and read the stories online, play some book-related games, and print out the booklets to use in your reading center or for children to take home. Our extension activities and printables will help to increase comprehension after reading. As a Story Twiggles member you will get instant access to over 70 Twiggle Books in different reading levels. We also are adding new Twiggle Books during the year. * Get one year access to more than 70 Twiggle Books and new books that will be added during the year. View our Twiggle Book types. * View Twiggle Books by reading levels. Read more about our Reading Levels. * Opt to Listen to the story or to Read the story. 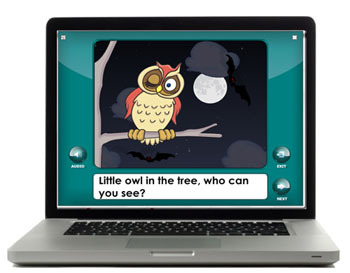 Some Twiggle Books contain a Quiz for an online game that relates to the story. View our Twiggle Book features. 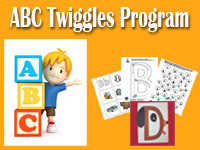 * Enjoy Twiggle Books that are aligned to the Kindergarten Common Core State Standards. 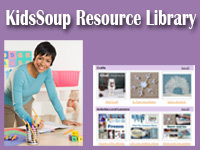 * Create Reading Rooms for groups of children with your selection of Twiggle Books. * Share the Twiggle Books with parents. Each Twiggle Book story can be printed in color and b/w. * Use our extension activities (coloring page, language arts activity, and writing worksheet) to build on each Twiggle Book story. * NOTE: currently our Twiggle Books are not viewable on iPads, however, we are working on it. Flash is required. Get one year unlimited access from anywhere in the world to the online library of currently 70 interactive, digital emergent reader Twiggle Books.